Johnny Cash was one of the most imposing and influential figures in post-World War II country music. With his deep, resonant baritone and spare, percussive guitar, he had a basic, distinctive sound. Cash didn't sound like Nashville, nor did he sound like honky tonk or rock & roll. He created his own subgenre, falling halfway between the blunt emotional honesty of folk, the rebelliousness of rock & roll, and the world weariness of country. Cash's career coincided with the birth of rock & roll, and his rebellious attitude and simple, direct musical attack shared a lot of similarities with rock. However, there was a deep sense of history -- as he would later illustrate with his series of historical albums -- that kept him forever tied with country. And he was one of country music's biggest stars of the '50s and '60s, scoring well over 100 hit singles. Cash was born and raised in Arkansas, moving to Dyess when he was three. By the time he was 12 years old, he had begun writing his own songs. He was inspired by the country songs he had heard on the radio. While he was in high school, he sang on the Arkansas radio station KLCN. Cash graduated from college in 1950, moving to Detroit to work in an auto factory for a brief while. With the outbreak of the Korean War, he enlisted in the Air Force. While he was in the Air Force, Cash bought his first guitar and taught himself to play. He began writing songs in earnest, including "Folsom Prison Blues." Cash left the Air Force in 1954, married a Texas woman named Vivian Leberto, and moved to Memphis, where he took a radio announcing course at a broadcasting school on the GI Bill. During the evenings, he played country music in a trio that also consisted of guitarist Luther Perkins and bassist Marshall Grant. The trio occasionally played for free on a local radio station, KWEM, and tried to secure gigs and an audition at Sun Records. Cash finally landed an audition with Sun Records and its founder, Sam Phillips, in 1955. Initially, Cash presented himself as a gospel singer, but Phillips turned him down. Phillips asked him to come back with something more commercial. Cash returned with "Hey Porter," which immediately caught Phillips' ear. Soon, Cash released "Cry Cry Cry"/"Hey Porter" as his debut single for Sun. On the single, Phillips billed Cash as "Johnny," which upset the singer because he felt it sounded too young; the record producer also dubbed Perkins and Grant the Tennessee Two. "Cry Cry Cry" became a success upon its release in 1955, entering the country charts at number 14 and leading to a spot on The Louisiana Hayride, where he stayed for nearly a year. A second single, "Folsom Prison Blues," reached the country Top Five in early 1956 and its follow-up, "I Walk the Line," was number one for six weeks and crossed over into the pop Top 20. Cash had an equally successful year in 1957, scoring several country hits including the Top 15 "Give My Love to Rose." Cash also made his Grand Ole Opry debut that year, appearing all in black where the other performers were decked out in flamboyant, rhinestone-studded outfits. Eventually, he earned the nickname of "The Man in Black." Cash became the first Sun artist to release a long-playing album in November of 1957, when Johnny Cash With His Hot and Blue Guitar hit the stores. Cash's success continued to roll throughout 1958, as he earned his biggest hit, "Ballad of a Teenage Queen" (number one for ten weeks), as well another number one single, "Guess Things Happen That Way." For most of 1958, Cash attempted to record a gospel album, but Sun refused to allow him to record one. Sun also was unwilling to increase Cash's record royalties. Both of these were deciding factors in the vocalist's decision to sign with Columbia Records in 1958. By the end of the year, he had released his first single for the label, "All Over Again," which became another Top Five success. Sun continued to release singles and albums of unissued Cash material into the '60s. "Don't Take Your Guns to Town," Cash's second single for Columbia, was one of his biggest hits, reaching the top of the country charts and crossing over into the pop charts in the beginning of 1959. Throughout that year, Columbia and Sun singles vied for the top of the charts. Generally, the Columbia releases -- "Frankie's Man Johnny," "I Got Stripes," and "Five Feet High and Rising" -- fared better than the Sun singles, but "Luther Played the Boogie" did climb into the Top Ten. That same year, Cash had the chance to make his gospel record -- Hymns by Johnny Cash -- which kicked off a series of thematic albums that ran into the '70s. The Tennessee Two became the Tennessee Three in 1960 with the addition of drummer W.S. Holland. Though he was continuing to have hits, the relentless pace of his career was beginning to take a toll on Cash. In 1959, he had begun taking amphetamines to help him get through his schedule of nearly 300 shows a year. By 1961, his drug intake had increased dramatically and his work was affected, which was reflected by a declining number of hit singles and albums. By 1963, he had moved to New York, leaving his family behind. He was running into trouble with the law, most notably for starting a forest fire out West. June Carter -- who was the wife of one of Cash's drinking buddies, Carl Smith -- would provide Cash with his return to the top of the charts with "Ring of Fire," which she co-wrote with Merle Kilgore. "Ring of Fire" spent seven weeks on the top of the charts and was a Top 20 pop hit. Cash continued his success in 1964 as "Understand Your Man" became a number one hit. However, Cash's comeback was short-lived as he sank further into addiction, and his hit singles arrived sporadically. Cash was arrested in El Paso for attempting to smuggle amphetamines into the country through his guitar case in 1965. That same year, the Grand Ole Opry refused to have him perform and he wrecked the establishment's footlights. In 1966, his wife Vivian filed for divorce. After the divorce, Cash moved to Nashville. At first, he was as destructive as he ever had been, but he became close friends with June Carter, who had divorced Carl Smith. With Carter's help, he was able to shake his addictions; she also converted Cash to fundamentalist Christianity. His career began to bounce back as "Jackson" and "Rosanna's Going Wild" became Top Ten hits. Early in 1968, Cash proposed marriage to Carter during a concert; the pair were married in the spring of 1968. In 1968, Cash recorded and released his most popular album, Johnny Cash at Folsom Prison. Recorded during a prison concert, the album spawned the number one country hit "Folsom Prison Blues," which also crossed over into the pop charts. By the end of the year, the record had gone gold. The following year, he released a sequel, Johnny Cash at San Quentin, which had his only Top Ten pop single, "A Boy Named Sue," which peaked at number three; it also hit number one on the country charts. Cash guested on Bob Dylan's 1969 country-rock album Nashville Skyline. Dylan returned the favor by appearing on the first episode of The Johnny Cash Show, the singer's television program for ABC. The Johnny Cash Show ran for two years, between 1969 and 1971. Cash was reaching a second peak of popularity in 1970. In addition to his television show, he performed for President Richard Nixon at the White House, acted with Kirk Douglas in The Gunfight, sang with John Williams and the Boston Pops Orchestra, and he was the subject of a documentary film. His record sales were equally healthy as "Sunday Morning Coming Down" and "Flesh and Blood" were number one hits. 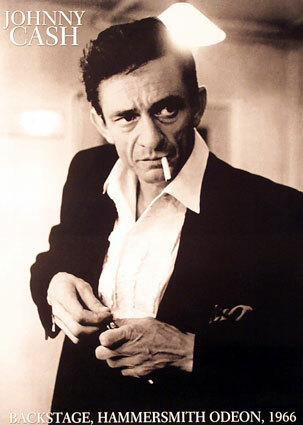 Throughout 1971, Cash continued to have hits, including the Top Three "Man in Black." Both Cash and Carter became more socially active in the early '70s, campaigning for the civic rights of Native Americans and prisoners, as well as frequently working with Billy Graham. In the mid-'70s, Cash's presence on the country charts began to decline, but he continued to have a series of minor hits and the occasional chart-topper like 1976's "One Piece at a Time," or Top Ten hits like the Waylon Jennings duet "There Ain't No Good Chain Gang" and "(Ghost) Riders in the Sky." Man in Black, Cash's autobiography, was published in 1975. In 1980, he became the youngest inductee to the Country Music Hall of Fame. However, the '80s were a rough time for Cash as his record sales continued to decline and he ran into trouble with Columbia. Cash, Carl Perkins, and Jerry Lee Lewis teamed up to record The Survivors in 1982, which was a mild success. The Highwaymen -- a band featuring Cash, Waylon Jennings, Willie Nelson, and Kris Kristofferson -- released their first album in 1985, which was also moderately successful. The following year, Cash and Columbia Records ended their relationship and he signed with Mercury Nashville. The new label didn't prove to be a success as the company and the singer fought over stylistic direction. Furthermore, country radio had begun to favor more contemporary artists, and Cash soon found himself shut out of the charts. Nevertheless, he continued to be a popular concert performer. The Highwaymen recorded a second album in 1992, and it was more commercially successful than any of Cash's Mercury records. Around that time, his contract with Mercury ended. In 1993, he signed a contract with American Records. His first album for the label, American Recordings, was produced by the label's founder, Rick Rubin, and was a stark, acoustic collection of songs. American Recordings, while not a blockbuster success, revived his career critically and brought him in touch with a younger, rock-oriented audience. In 1995, the Highwaymen released their third album, The Road Goes on Forever. The following year, Cash released his second album for American Records, Unchained, which featured support from Tom Petty & the Heartbreakers. His VH1 Storytellers outing was released in 1998, and in the spring of 2000 Cash compiled Love, God, Murder, a three-disc retrospective focusing on the major songwriting themes dominant throughout his career. The new studio album American III: Solitary Man appeared later that year. Health problems plagued Cash throughout the '90s and into the 2000s, but he continued to record with Rubin; their fourth collaboration, American IV: The Man Comes Around, was released in late 2002. The following year, the Mark Romanek-directed video for his cover of Nine Inch Nails' "Hurt" garnered considerable acclaim and media attention, culminating in an unexpected nomination for video of the year at the MTV Video Music Awards. Not long after the video sparked numerous stories, his beloved wife June Carter Cash died on May 15, 2003, of complications following heart surgery. Four months later, Johnny died of complications from diabetes in Nashville, TN. He was 71.